Sticking with tradition, we’re going to create a very simple ‘Hello, World!’ application, without using a graphical user interface builder; we’re just writing code, to give you a rough feel for how iOS applications hang together. To start with we’re going to need a copy of Xcode and the iOS Software Development Kit (SDK). Apple maintains control over their developer tools, so you’ll eventually need to sign up for the Apple Developer Program if you want to publish your app. Xcode is free to download once you’ve signed up for the iOS Developer program, and being a member is the only way to test your app on real-deal Apple hardware. When signing up to the iOS Developer Program, you can use an existing iTunes, Apple Online Store, or MobileMe account. Once you have established your account, you can download Xcode and the iOS Developer Kit from the iOS Dev Center. You can also purchase Xcode 4 on the Mac App store for AU$4.99. This will give you the ability to run your iOS programs in the Simulator on your Mac (a software emulation of an iPad or iPhone), but you won’t be able to run your programs on actual Apple hardware until you sign up for the iOS Developer Program. Normally when making an iOS application, you’ll be advised to use Apple’s UI design tools (formerly known as ‘Interface Builder’). That’s definitely the way to go, unless you’re building very complex, dynamic interfaces (games, data visualisation tool, and so on). Once your app starts to get even slightly complex, futzing with your UI in code becomes a real pain – adjust, compile, test, repeat ad nauseam! It’s good to know what’s happening under the hood though, so to begin with we’ll create a really basic app purely in code. The next article in this series will discuss using Interface Builder. 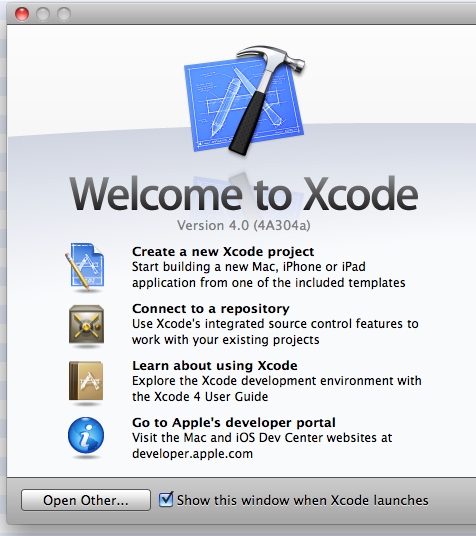 Start Xcode, and you’ll come upon the welcome screen; the left side will look like Figure 1, “Welcome to Xcode”. 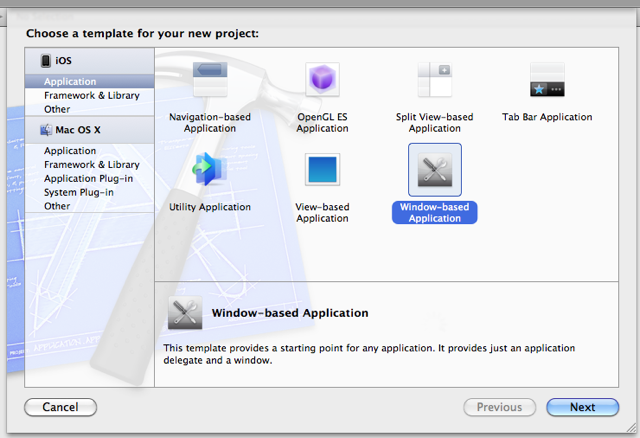 Click New Project, and Xcode’s New Project dialog will appear, as shown in Figure 2. You can reach this dialog at any time by selecting File > New Project. To find out more about the different types of iOS applications, see iOS Development Quick Start in the iOS Developmer Library. We’ll start with a Window-based Application. This is the barest-bones of the options. Name your project as you see fit, but note that we’ll use ‘HelloWorld’ as a token in our examples to represent whatever name you choose if it is different. We configure the rest of our settings as displayed in Figure 3. Because the Company Identifier is just a string used to identify who made the application, it can be anything. Often, companies use the convention of a reversed domain name as their identifier, e.g. com.buildmobile. This string is concatenated with the Product Name to generate the Bundle Identifier, which should as a result be a unique, human-readable string identifying your application. We’re going to keep things simple for now, so change Device Family to ‘iPhone’. It’s possible to write applications that run on both iPhone and iPad devices (without having to make separate versions of your app). We won’t do that (yet). For the purposes of this exercise, make sure ‘Use Core Data’ and ‘Include Unit Tests’ are unchecked. We’ll revisit these options in a later tutorial. Hit ‘Next’ and you’ll be asked where you want to save your application. Down the bottom of that dialog box is an option labelled ‘Source Control – Create local git repository for this project’. Use of source control in Xcode 4 goes beyond the scope of this article, but it’s good to have, and we’ll revisit this later too. Hit ‘Create’, and you’re ready. iPhone apps all have a fairly common structure. Each app will (usually) have a main.m file (under Supporting Files in the File Browser) that instantiates the AppController (more on this in a bit). iOS applications are written in a language called Objective-C. Sometimes this is referred to as Cocoa, but strictly speaking Cocoa refers to the libraries and APIs Apple provides. We declare objects and data structures in ‘header’ files (*.h) and then write the code that implements them in separate implementation files (*.m). According to many sources, the ‘m’ stands for ‘message’, which is a core feature of the Objective-C language. The Supporting Files directory (formerly ‘Resources’ in Xcode3) is where all of your non-code files should live. Once you start developing more intricate apps, you’ll want to put images, text files, and other miscellanea here. Figure 4 displays our file and directory structure so far. The AppController is the first entry point for OS messages into your application. 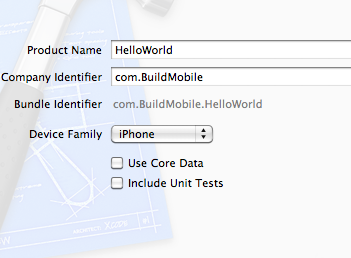 It’s worth taking a look through HelloWorldAppDelegate.m for an idea of the events your app will need to respond to. Some of these methods are more or less optional if you’re creating very simple applications, but if you’re planning to store data based on user input that’s of any significant complexity, you’ll want to implement methods like applicationWillResignActive and applicationDidBecomeActive. These methods allow you to respond to changes in your application’s life cycle, such as when it’s about to be terminated. An AppDelegate on its own doesn’t do much. We need to add a View. 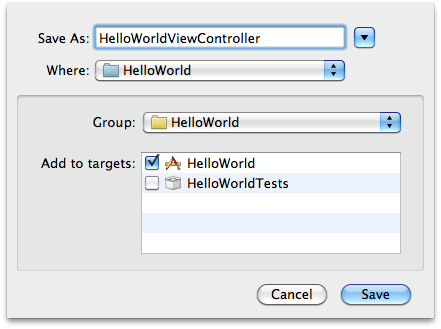 And because most iOS apps follow the Model-View-Controller pattern, we’ll also want a Controller for that View. They’re called ViewControllers in iOS; they let you switch between programmatically created Views like we’re using here, or Views designed via Xcode’s GUI, which are stored in XIB files. Note, using ViewControllers is highly recommended. Create a new file using File > New File (or Command+N). 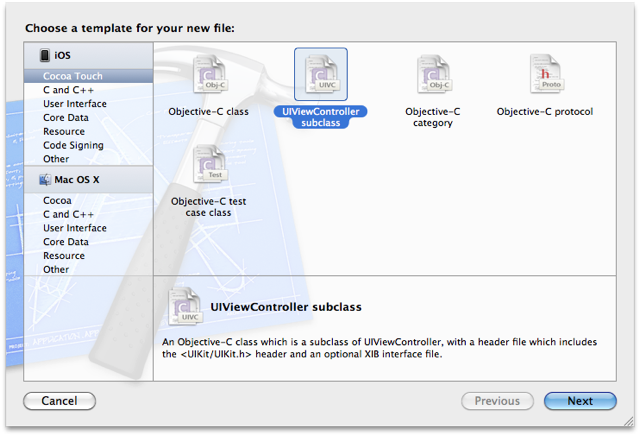 One of the options Xcode gives us is a UIViewController subclass. Neat! Select that. The first screen that appears will ask which class you want to sub-class from. You might want to subclass one of your own custom ViewController classes at times, but right now, select UIViewController as in Figure 5. By default, ‘targeted for iPad’ and ‘With XIB for user interface’ should be unchecked. If you find different defaults, uncheck both this time around. Check your selections against Figure 6 and click ‘Next’ when you are happy. You’ll be asked to ‘Save As’. Give your class a name in the ‘Save As’ field. We will be using HelloWorldViewController as in Figure 7 so you will need to substitute this with your own name, if it is different, during the remainder of this tutorial. Note that Xcode will automatically generate a header file for us (*.h), too. You should have two new files. These comprise your ViewController, which is in charge of receiving input events and responding to them by manipulating the View. Typically, one ViewController should be responsible for one View. That’s not a hard rule, though; it’s up to you if you want to organize your application differently. You’ll notice we added the ViewController as a property of the AppDelegate in the @interface definition. Later, we use @property, which is a bit of syntactic sugar to automatically declare getters and setters for that property, making it ‘public’ (by default, properties in objects in Objective-C are private). Switch over to your AppDelegate implementation file now. 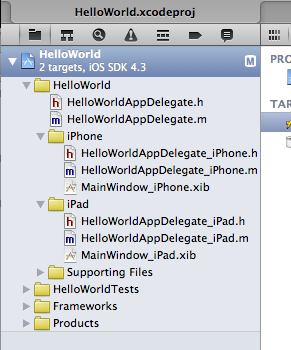 That’s the HelloWorldAppDelegate.m file. Did you know there is nice keyboard shortcut for switching between an implementation (*.m) and header (*.h) file, and vice-versa: its Command+Ctrl+Up. We can use @synthesize because we declared viewController to be a @property in the header file. @synthesize calls should, by convention, always follow your @implementation declaration and precede any method definitions. We added one line to allocate (alloc) the ViewController, and one to add the ViewController’s View to the Window. This is critical, because the Window needs to know about Views that it contains, and Views need to know about any other Views or UI elements they contain. We’re creating a nested hierarchy of Views. 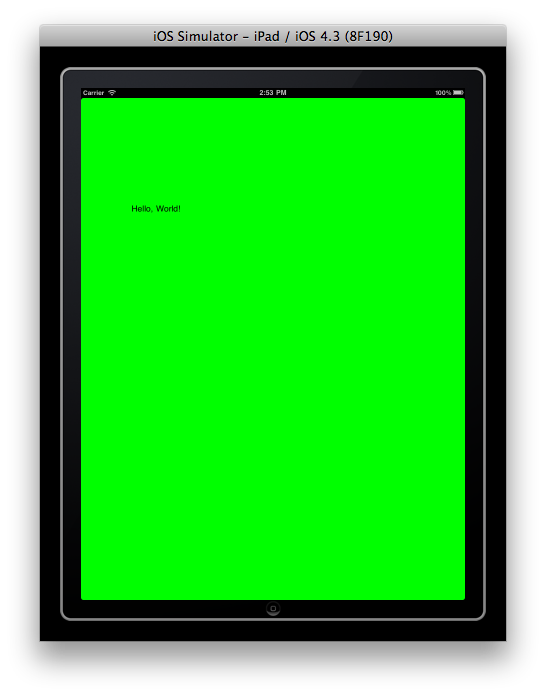 If you hit ‘Run’ now (Command+R) you should see an eye-shatteringly bright-green screen inside the Simulator. Well done! You’ve created a view. It’s quite boring here, though so let’s spice it up a little. You can close the Simulator now if you want to, with Command+Q just like a separate app. We’ve allocated memory for a UILabel element. We’ve initialized it with a width of 50 units and a height of 200 units, offset the x-axis 200 (up and down) and y-axis 80 (left to right). Hit ‘Run’ now and you should see the label appear in your View, as shown in Figure 9, ‘Our bright-green “Hello, World!” app’. Well done! It’s worth noting that by default, the application is also loading some elements (specifically the Window) from XIB (*.xib or *.nib) files included in the project. We’re overlaying our custom View on top of those. 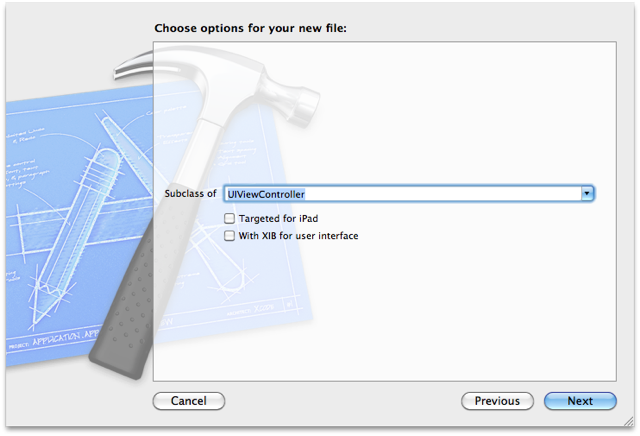 In our next article, we’ll learn to work with Interface Builder and XIB files to create an application. Andy White provides an intense meditation of developing apps on the iOS platform. With the prerequisite of having a tasty refreshing beverage in hand, use the tag to all Orny articles, or jump straight into an article specifically from this index.